(CN) – The 9th Circuit denied the Tulalip Tribes’ bid for additional licenses for video gambling machines, despite the tribe’s claim other members of the state gaming compact are being treated more favorably. The Tulalip claimed Washington allows the Spokane Tribe to lease more lottery terminals at a better rates, contrary to a “most favored” tribe guarantee for the Tulalip. The state regulates tribes’ operations of player terminals for a tribal lottery system under a Tribal-State Gaming Compact. The Tulalip can operate 975 terminals but may increase the amount up to 4,000 by purchasing allocation rights from any Washington tribe in the compact. The procedure is known as a terminal allocation plan, or TAP. In 2007, the Spokane Tribe joined other tribes in the gaming compact. The state allowed the tribe to make payments into an inter-tribal fund to obtain additional terminals if it couldn’t secure the machines under the TAP procedure because “few, if any” machines were available for lease, according to court documents. The Tulalip claimed the state gave the Spokane more favorable terms by allowing the tribe an additional way to obtain terminals and petitioned to have the same opportunity by amending its compact. After the state refused, the Tulalip filed a federal complaint in 2012 saying the state breached the compact and asking for an injunction amending the agreement. In 2013, U.S. District Judge Richard Jones granted summary judgment to the state, saying the Tulalip wanted to “cherry-pick” the benefits of the inter-tribal fund provision. The Tulalip appealed to the 9th Circuit. A three-judge panel ruled on Friday the state is not required to adopt the Tulalip’s amendment because it didn’t “mirror the restrictions” that were in the Spokane’s compact. Writing for the majority, Judge M. Margaret McKeown said the inter-tribal fund method “carries with it interdependent conditions and consequences” that the Tulalip’s amendment failed to include. The panel did not determine whether the Spokane compact was more favorable, according to the opinion. “The Tribe is evaluating its options,” the attorney said. Fight Over Gaming Terminals Goes to 9th Cir. (CN) – The Tulalip Tribes tried to persuade the 9th Circuit last week that Washington State is violating a gaming compact by providing more favorable terms to another tribe. The Tulalip claims Washington allows the Spokane Tribe to lease lottery terminals at better rates, contrary to a “most favored tribe guarantee saying if the state gives more favorable terms to another tribe, the Tulalip is also entitled to those terms. In 2013, U.S. District Judge Richard Jones granted summary judgment to the state, saying the Tulalip wanted to “cherry-pick” the benefits of the inter-tribal fund provision . According to the ruling, the Spokane were required to use “reasonable efforts” to obtain the machines from other tribes and must agree to limit their operations to fewer total machines than other tribes. “The State has never agreed to the select portions that plaintiff wishes to cherry-pick out of the Inter-Tribal Fund provision without the corresponding limitations,” Jones wrote. On Thursday, the Tulalip asked a three-judge panel to reverse the lower court’s decision. Lisa Koop, representing the Tulalip, said the tribe’s “most favored” status required Washington to offer them the same benefits as the Spokane. “That’s simply false,” Koop responded. She said the state wrongly concluded the Tulalip would have to “take everything” the Spokane were offered. “Some of the terms are specific to the Spokane tribe,” she argued. “The state basically said we’ll give you the same deal as the Spokane Tribe, but you didn’t want that because it contains a restriction on the maximum number of machines that would reduce the number of machines that you have,” Tallman countered. “You’d like access to the tribal fund but you’d also like to not have the numerical restrictions that go with it, right?” U.S. Circuit Judge M. Margaret McKeown asked. The state, represented by Assistant Attorney General Callie Castillo, argued that Tulalip’s most favored nation clause says that if the state ever permits an allocation of player terminals to a tribe which is greater or on more favorable terms then Tulalip is entitled to those same terms. “Nothing in Tulalip’s compact permits it to obtain more favorable terms than those obtained by any other Washington tribe,” Castillo said. McKeown asked if other tribes could make Tulalip’s “most favored” argument to ask for the inter-tribal fund plan. Castillo said “every other tribe in the state of Washington” could claim they were entitled to the same deal. “Tulalip is only entitled to the same terms as Spokane,” she said. The Spokane County commissioners are asking the U.S. Bureau of Indian Affairs to take another look at possible negative impacts of a proposed Indian casino near Fairchild Air Force Base. In a recent letter to the BIA, commissioners say new information has surfaced indicating that an “accident potential zone” could be extended into the area where the Spokane Tribe wants to build its resort. The Spokane Tribe says the casino would create jobs for tribal members and attract more businesses to Airway Heights, where the proposed project would be built. The Spokesman-Review says the tribe’s application is before the Office of Indian Gaming, which has not indicated when it might issue a ruling. If approved by the federal government, the casino would also require approval by Washington Gov. Jay Inslee. 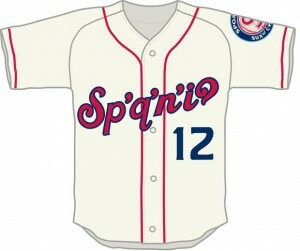 Beginning in the 2014 season, the Spokane Indians baseball team will sport the team name in Salish on home jerseys. That’s the Spokane Salish language version of the name. On opening day, June 13, this Short Season Class A minor league baseball team will become the first-ever professional baseball team to use a Native American language in this way. The jersey is the fruit of an unusual collaboration between a team and a tribe. Unusual, because in several high-profile examples – the Washington Redskins and the Cleveland Indians, to name two – the issue of Indian-related team names and mascots has generated more controversy than collaboration. In Cleveland, the “Chief Wahoo” mascot has been derided as a demeaning cartoon; in Washington, D.C., the team name has been derided as just plain racist. In Spokane – or should we say Sp’q’n’i – both the tribe and its namesake team have worked hard in recent decades to establish the name Spokane Indians as a tribute, as opposed to just a mascot. In 2006, the tribe helped to create new circular team logo, with words written in the Salish language. This year, the tribe worked with the team in creating the new Sp’q’n’i jersey, and supplied the team with an accurate rendering of the word (which also includes a final symbol not found in the English alphabet). Both Rudy Peone, chairman of the Spokane Tribe of Indians, and Otto Klein, senior vice president of the Spokane Indians baseball team, are acutely aware of how sensitive these issues can be. That’s why the two institutions have developed a collaboration. Barry Moses, a Spokane Tribe member who teaches Salish language classes at the Salish School of Spokane, has mixed feelings about it. Peone believes this is the first time a professional baseball team has used a native language in this way on a uniform. “There have been Native American teams that have done it, but, yes, this is the first time that we know of that a professional team has done so,” said Peone. Meanwhile, the baseball team is working on giving Salish an even higher profile throughout Avista Stadium. Many of the signs in the park will be in both English and Salish. The team is also expanding its existing historical exhibit about the tribe, and moving it to more prominent positions around the park. The game jerseys themselves will be auctioned off at the end of the season, and proceeds will go to tribal youth programs. Klein said he thinks local fans will quickly grasp the meaning and significance of the name. But what about visiting fans from out of town? Might they be confused about that word on the front of the uniforms? Klein said the section leaders will have information cards about the name and they will be happy to use the question as a “conversation piece” about the team’s 100-plus year tribal connection. The preservation of the Salish language is particularly close to the hearts of many tribal members, because, as the decades go by, fewer and fewer people are fluent in the Spokane dialect of Salish. Peone called the new jerseys a way to “educate thousands of baseball fans about the language and culture” of the city’s first inhabitants. Many Northwest tribes shared the Salish language, yet many had their own distinct dialect. In Moses’ estimation, there are only five or six fluent Spokane Salish speakers left, most of them elderly. However, there has been a recent resurgence of interest among younger generations. The Salish School of Spokane even has full-immersion Salish preschool. The team won’t be able to wear the jerseys in every home game – at least not this year. The baseball team originally hoped the new Salish jerseys could be their everyday 2014 home jerseys. However, the team didn’t get the designs submitted to the league office before the deadline, so the Sp’q’n’i jerseys can only be used as “alternate” jerseys in 2014, which means they can be worn in under half of the home games. Klein said the team will wear them at most of 2014’s “biggest” home games, including Fridays, Saturdays and holidays, and also at the home opener. Then, in 2015, the Sp’q’n’i jerseys will be the primary home jerseys. Klein said the collaboration has given his team a unique identity, steeped in history. The coalition decries the Cleveland Indians’ Chief Wahoo, the “tomahawk chop” and the name Washington Redskins. Yet there is no consensus on this complicated issue, as evidenced by the fact that the sports teams at Wellpinit High School, the main high school on the Spokane Reservation, are named the Redskins. The Spokane Indians baseball team does not use an Indian-costumed mascot. The team’s mascot is Otto, a bright blue “reptile with style.” Nor does the team lead its fans in the tomahawk chop. To Peone, the use of the Salish language in the logo and jerseys makes the Spokane Indians “more than a mascot.” He said the tribe has been generally supportive of the partnership because of the way in which it kas been done. Meanwhile, the unique Sp’q’n’i jerseys may prove to be a big hit at the merchandise store – although Klein said that was certainly not the team’s motivation. A portion of those proceeds, too, will go toward tribal youth programs. SPOKANE — The vice chairman of the Spokane Tribe has resigned under pressure from tribal members. The Spokesman-Review reported that Rodney W. Abrahamson resigned Thursday. Abrahamson had been convicted of five misdemeanors after he illegally killed two bison north of Yellowstone National Park in February. Montana wildlife agents say he lied about his identity and claimed to be a member of the Nez Perce Tribe, which has treaty rights to hunt bison. The Spokane Tribe’s constitution said council members cannot remain in office if convicted of a felony or of a misdemeanor involving dishonesty. Abrahamson was convicted of obstruction as a result of providing a false identity. After he refused to resign, some tribal members launched a recall effort. A special election will be held in June to select his replacement. Casino Battle: Why the Opposition to Spokane Tribe’s Anti-Poverty Plan? The Bureau of Indian Affairs issued a final report in February endorsing a large, off-reservation casino and hotel development for the Spokane Tribe in eastern Washington, but observers of Indian gaming say this doesn’t quite mean the tribe can start up the earth-movers. The project requires both federal and state approval, and only five tribes across the U.S.—including the neighboring Kalispel Tribe, which is opposing the Spokane on this project—have been granted such two-part permission for off-reservation gaming in the 25 years under the Indian Gaming Regulatory Act. In addition, the Spokane’s quest to build a casino close to the city of Spokane, which has nearly 500,000 people in its greater metro area, has encountered strong opposition from groups that say what’s good for the Spokane would be bad for them. This includes the Kalispel, whose Northern Quest Resort & Casino is less than four miles away on trust land, and local business groups that fear the new casino could destroy the regional economy if it endangers the area’s largest employer, Fairchild Air Force Base. The Spokane Tribe’s property is about two miles from the base, which has raised concerns about encroachment of flight paths, potentially making Fairchild vulnerable to a future round of base closures by the federal government. The BIA, in its final environmental impact statement, gives lengthy rebuttals to the encroachment issue, noting that Fairchild officials—as well as the United States Air Force—participated in joint land-use planning efforts and concluded the Spokane’s casino and hotel development does not pose a significant safety threat to the base. In addition, Spokane Tribal Chairman Rudy Peone and others say Fairchild is short-listed as one of the bases that could house the new Boeing KC-46 military aerial refueling and strategic transport aircraft. Supporters of the Spokane’s casino see this as a vote of confidence against closure. The project would include retail space. proposal. Hadley and Spokane County officials previously stated that the 30-day comment period on the Final environmental impact statement, which ended March 4, was too brief. After a request from Representative Cathy McMorris Rodgers, (R-Washington), writing on behalf of the county, the BIA has extended the comment period to May 1. The Spokane Tribe wrote the agency to say it did not oppose the extension. Still, Hadley said opponents will likely focus their attention on Jewell (if appointed) and Inslee. So, “when you think about who do you communicate with, you are probably naming them,” Hadley adds. Ben Stuckart, president of the Spokane City Council, counters, “I really think a lot of the opposition boils down to economic encroachment. I don’t think that’s ever a reason to oppose a project that will bring jobs and alleviate poverty.” The city council split four to three to oppose a new casino. Spokane’s mayor, David A. Condon, is also an opponent. Examination of the proposal—for which gaming would grow to 2,500 electronic gaming machines, 50 table games and 10 poker rooms—now goes to the BIA’s Office of Indian Gaming and, ultimately, to the Assistant Secretary—Indian Affairs at the Department of Interior, before the feds release a Record of Decision, an open-ended review process which is expected to take months. The proposal is for more than just a casino. The Spokane Tribe Economic Project also includes a 300-room hotel, several restaurants ranging from fast food to fine dining, a standalone big-box retail site along with a shopping mall, a 10,000-square-foot tribal cultural center and a tribal police and fire station. On the harm side, the Kalispel have risen from dire poverty thanks to Northern Quest, which has recently undergone a $210 million expansion. The tribe, which has closed its enrollment at roughly 425 members since the casino opened, has constructed a wellness center and helps members with housing, health care and education. It also is robustly funding language preservation and other initiatives. The Spokane Tribe, “should be encouraged,” that the BIA endorsed the full Class III gaming-plus-hotel-plus-retail option in the final environmental impact statement, says Ron Allen, longtime chairman of Washington’s Jamestown S’Klallam Tribe and chairman of the board of the Washington Indian Gaming Association. But, he adds, “When a tribe already has a casino and they want another location, a better location, the bureau takes that into serious consideration.” Also, Allen says, protection of a gaming tribe’s debt load is a significant and fairly new consideration for the BIA when weighing the risks of another tribe’s entry into the market. The Kalispel Tribe, which did not agree to interviews for this story, has made protection of its revenue stream from Northern Quest a central argument against the Spokane Tribe’s proposal. Northern Quest is the Kalispel’s only method of funding tribal services, Chairman Glen Nenema has pointed out in letters to the BIA. He and others note the Kalispel reservation is small, remote and that much of it is a floodplain, severely restricting commercial opportunities. Patrick D. Rushing is mayor of the city of Airway Heights, located between the Kalispel’s Northern Quest and the Spokane Tribe’s 145-acre site. He is enthusiastic about both projects. He says he’s optimistic about the chances of a new casino, citing a December 11 and 12 visit by Interior’s Assistant Secretary, Indian Affairs, Kevin Washburn. “He went out and looked at the Kalispel Tribe’s reservation and all of the improvements that were made and went through Northern Quest and saw all this nice stuff. The next day, he went out to Two Rivers and Wellpinit [on the Spokane reservation] and on to the Chewelah casino and could see the vast difference,” Rushing recalls. In its impact statement, the BIA devoted an appendix to addressing the Kalispel contentions that a new casino will reduce its revenues by as much as 50 percent and will not expand the market. A report by the New Orleans–based Innovation Group in the final Environmental impact statement disputes this, offering many examples around the country of a new casino entering a market and all casinos seeing increased revenue. OLYMPIA – Gov. Jay Inslee wouldn’t say Wednesday which way he’s leaning on the Spokane Tribe’s proposed casino on the West Plains. Inslee has the final ability to block the project near Fairchild Air Force Base even if federal officials sign off on it. “It will be important for me to make the decision based on the facts and the evidence,” he said. The decision will come after a “clean, academic, dispassionate review” but beyond that, he said he believed it was best not to discuss the casino or whether he would support more gambling facilities in the state. “There are ramifications for the state beyond this specific application. I will be considering those in the decision,” Inslee said. In his campaign for governor, Inslee received support from both the Spokane Tribe, which wants to build the casino, and the Kalispel Tribe, which owns the nearby Northern Quest casino and is opposed to the proposed facility. Each tribe gave Inslee $3,600, the maximum contribution from an individual source. Overall, Indian tribes contributed $60,675 to Inslee’s gubernatorial campaign compared to $11,600 to his Republican opponent, Rob McKenna. Neither the Spokanes nor the Kalispels contributed to McKenna’s gubernatorial campaign. Last week the federal Bureau of Indian Affairs released an environmental impact statement that said its preferred alternative was the largest of three construction options the Spokane Tribe has proposed for land north of U.S. Highway 2, across from the base. The agency continues to take comments before issuing its “record of decision,” after which the secretary of the interior must decide whether the casino is in the best interests of the tribe and the surrounding community. After that, Inslee must agree with the secretary’s decision before gambling can occur on the property. Spokane County commissioners, freed from an agreement that previously prevented them from commenting, have passed a resolution opposing the Spokane Tribe’s plan to build a big casino complex at Airway Heights, near Fairchild Air Force Base. The commissioners on Tuesday afternoon voted unanimously to oppose the project in large part because they fear it could imperil the future of the base, which is Spokane County’s largest employer. Air Force base officials have not taken a position on the casino, which would be about a mile from the base. Leaders of the Spokane Tribe didn’t immediately return a telephone call seeking comment. The Spokane Tribe is seeking rare federal approval to build the casino in the city of Airway Heights, miles from the boundaries of its reservation. A decision is expected in the next 45 days. The project is opposed by the Kalispel Tribe, which already has a large and successful casino in Airway Heights. In 2010, the city of Airway Heights reached an agreement with Spokane County commissioners in which the commissioners would remain silent on the proposed casino in exchange for payments to the county of $120,000 a year from casino revenues to deal with impacts. But the two county commissioners who supported that deal have since left, and the new commissioners threatened to sue if the agreement was not torn up. The city of Airway Heights released the county from the agreement last week, and county commissioners wasted little time in voicing their opposition. The commissioners’ position will be sent to the U.S. Department of the Interior, the Bureau of Indian Affairs and the state of Washington, which all must approve any proposal for off-reservation gambling by the Spokane Tribe. Casino supporters say the project will provide revenues to lift many members of the Spokane Tribe out of poverty, and provide some 1,200 jobs in the region. But opponents, including many Spokane area political and business leaders, worry the proposed casino is too close to the base and may prompt the Air Force to restrict operations or even close the base in the future because of encroachment issues. Airway Heights continues to support the casino project.